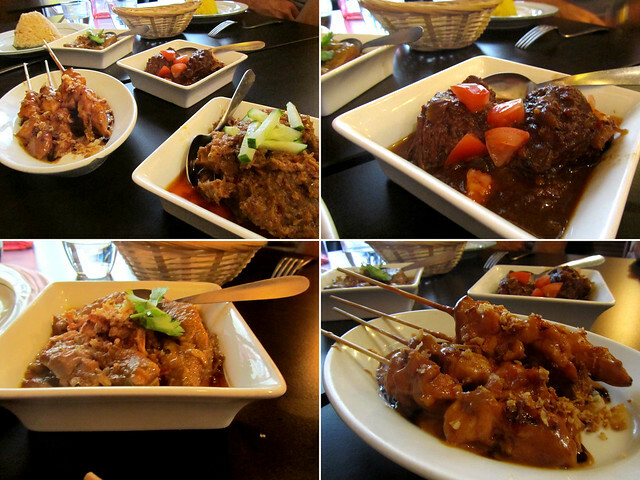 Visiting friends always make the best excuse to eat in new restaurants (well, new to us anyway) and we took advantage of it recently to check out an Indonesian restaurant not far from our place. 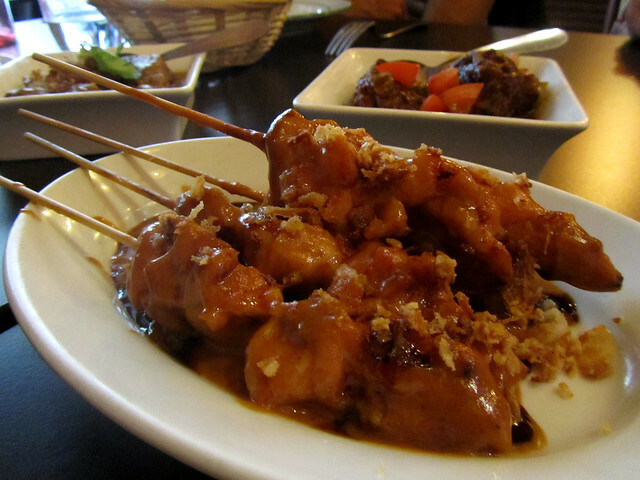 Restaurant Indonesia – I know, not the most imaginative of name but does the job perfectly – is just steps away from Luxembourg Garden, thus location-wise, it’s central and a walk in Luco after lunch would have been a good option. When it is not raining, that is. The restaurant is long and narrow, and upon arrival we were warmly welcomed by the sole server(!) waiting on all the tables in the dining room. On a Saturday afternoon in a restaurant full of diners, that was an impressive feat. She left us to peruse the menu at our leisure – a small basket of prawn crackers was also deposited in the centre of the table so we can snack in the mean time – and we decided to go for the rijstafel (i.e. rice table – a Dutch word in origin, bearing in mind Indonesia was formerly a Dutch colony) where we would have a selection of dishes to share between us instead of restricting ourselves to just a handful few main dishes. When the main dishes arrived (in small dishes that were meant for two portions per serving) the table nearly ran out of space to contain them all. Eight plates and bowls of food plus four additional rice-filled plates, that was indeed a small feast. From the meat rijstafel: deliciously succulent grilled chicken satay (Malaysian’s streetside chicken satay still trumps in my book but this was a good second), beef curry with creamy coconut milk (“beef rendang”), lamb curry (“gulai kambing”), and nutmeg and sweet soya sauce-marinated beef (“semur jawa”). 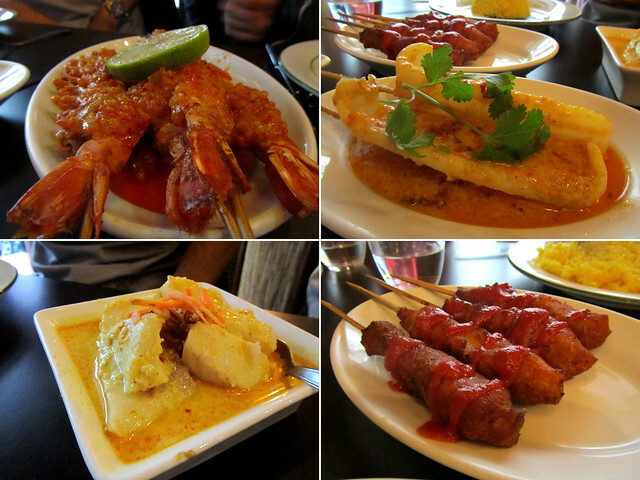 On the seafood front: gambas satay (which I cannot eat, drat silly sensitivity and I forgot my antihistamine), fish curry, calamari sticks (“cumi bali”) and fish fritters (“lilit goreng”). The fish was served in a lemongrass-fresh curry, light and not overpowering the delicate taste of the fish, while the fritters on stick could do with some sauce on the side in my opinion. I couldn’t quite discern the flavour of the sauce in which the calamari was served after all the heavier spiced meat dishes, but I certainly enjoyed eating the remainder of the dish, which again, the others had had enough of. I think a couple of them are simply not fans of its texture, but it did mean I get extra serving of it so I am not complaining! did you get my email on the LS deal?